Time's running out. 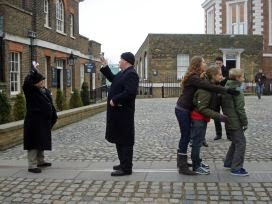 It's currently free to take a look around the Royal Greenwich Observatory and to stand on the meridian line in the courtyard with your feet in separate hemispheres. But it won't be free for long. A ten pound entrance charge is being imposed in a fortnight's time (starts 10am, Tuesday 8th March). If you fancy a look round the home of time for nothing, you'd better hurry. Entrance to the Observatory has been free since 2001, with approximately 1½ million visitors passing through each year. The owners say that this has significantly increased wear and tear on the site, so they needs your money. Without extra revenue, they argue, there'll be no improvements to the visitor experience. They don't say it's the recession or cuts have brought this sudden change around, but that must be a factor. And this way they can expect fewer visitors, so less wear and tear, so maybe that will keep them happier. Adults will be charged £10 (up from zero) and senior citizens £7.50 (up from zero). Children under 16 will, however, continue to get inside for nothing (which will be a relief for large families). As a bonus each ticket will allow you back inside over the next 12 months as many times as you like, although you'd have to be a bit of a time and space nut to think that's going to be useful. I'm a bit of a time and space nut, so I go to the Royal Greenwich Observatory fairly regularly. I even tell you about it sometimes (2004, 2004 again, 2007, 2009). But even I'd find it difficult to get value for money out of an annual pass. I know the place too well to want to fork out a tenner to see the same things again, and then again within twelve months. So I went round one last time yesterday before I probably don't ever bother to go round again. There's no money-collecting window at the entrance to the Royal Greenwich Observatory today. There used to be, even when entrance had been free for years, so that visitors could be issued with a special ticket which said £0-00. But these days you stroll straight through, then turn right for all things chronological. The ticket desk is ready and waiting inside the Information building, where for now a bored woman sits ready to sell you a souvenir programme or audio guide (note for punters: there's also a selection of London 2012 goodies, every single item with the "Union Jack" version of the logo because presumably that's the only version that sells). Then out through the garden, around the corner and there's the legendary Meridian Courtyard. Here's the line where everybody wants their photo taken. One foot in the western hemisphere, one in the east, and a great big grin before the shutter clicks. Many of those milling around are foreign tourists, and the Observatory is very much hoping that the imposition of admission charges won't put them off. Once they've walked across Greenwich Park and panted up the hill, of course they're going to fork out to look inside. Londoners who live closer by may not be so willing, however. They're likely to make do with a photograph on the runty strip of meridian that crosses the footpath immediately below, if indeed they can be bothered at all. But the courtyard's the place for a 'proper' photo. If you want any hope of getting your shot without anybody else in it, come immediately after the gates open at 10am. Or come on a weekday. Or come after 8th March. Apart from the famous line through the cobbles [photo], what else will you get for your £10? There's a camera obscura (which was especially obscure yesterday, and which I've never seen working). There's Flamsteed House, where the old Astronomer Royals lived and worked, now home to an exhibition on time. They've got John Harrison's historic chronometers, the ones which solved The Longitude Problem, and several other clocky exhibits. I love this stuff, but I bet most visitors will continue to walk through fairly quickly without engaging at any deep level. There's the Octagon Room, restored to Georgian glory, from whose roof the Time ball drops at 1pm daily. 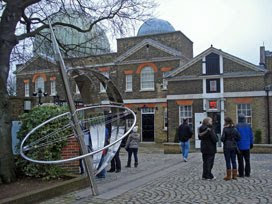 There's the Meridian Building with its old telescopes, one of which precisely defines the current Greenwich Meridian. And there's a climb up a rickety spiral staircase to see the largest refracting telescope in Britain, still functional beneath its copper dome. Not bad for a tenner if you're genuinely interested, although that's a big 'if' for many. Rest assured that the remainder of the Observatory site will remain free to view. Turn left for the Astronomy Centre, opened 2007, and for the courtyard around the Peter Harrison Planetarium. If you have children this is the half they'll be much more interested in, with lots of interactive exhibits and flashy visuals, plus they'll be learning something at the same time. I asked at the front desk and they confirmed, this bit's definitely still free after March. But not the main chunk of the Observatory, the zero line that everybody really wants to see. Fifteen days to go. Hurry, there's still time.